This is a story about Julio Corpeno. It’s a story about drive, commitment and integrity. Julio and his family came to Canada from El Salvador. They didn’t have much but they were a proud family – they believed in each other, respected each other and believed people were innately good. Julio Corpeno is as East-Van as it comes. In no way is that being used pergoratively. He is as proud of where he’s from as anyone could be. Born, raised and still roaming Commercial Drive – Julio is a fixture in our community, be it at the Trojan Boxing Club at the Santa Barbara market or at Café Calabria. I met Julio (Jay from now on) at the end of his grade 9 year. He was in a traditional high school and things weren’t working out. He found the framework of high school uninspiring. He started skipping classes or being so unmotivated that he let the work slide by – he was in need of a change. I remember meeting his sister. She was a really strong advocate for her little brother. She didn’t want Jay to stray too far from the safe bounds of the family. Taking Jay in was easy. He was a very polite but reserved kid. He wasn’t a behavioural problem like so many of the other Streetfront kids, rather he was withdrawing from life. He and the family agreed to give us a shot and come September, Jay was in our class. Jay was part of the second class I ever taught at Streetfront. He was a classmate and best friends with Matthew Martins, the boy I wrote about who was murdered at 16. Streetfront back then was just starting to come into the program I hoped it to be. That year would have us complete our 1st full marathon (Mauricio Garcia – he came back last year to run his 5th marathon with us, 16 years after his first) and the Street2Peak Project would be more than decade away. I was trying to find my way as a teacher and Jay was doing the same as a student. I don’t think I had the biggest impact on Jay. I was close to him and we were tight but nothing really profound. Jay liked the physical stuff but was really into video games, art and mountain biking. I liked the mountain biking but didn’t have a lot to offer on the other two. Jay’s year at Streetfront was pretty uneventful – not that Jay was a forgettable kid, not a chance but rather, he kept things pretty close. Jay was struggling to find his passion but you could tell once he found the drive, he’d be off. He was a strong writer with an evocative mind. He finished his grade 10 year and decided to go to Spectrum, a senior alternative program based out of Vancouver Technical. At Spectrum, he really enjoyed a creative writing class. They were studying a play and something clicked. He started to wonder what it would be like to be the actors performing these works. He started to envision what that dangerous and frightening world would be like. He started talking to his teacher and he suggested that if he really wanted to explore this, he should transfer to Templeton Secondary and enroll in their vaunted drama program, Theatre Temp. I’d like to think I helped Jay reach his potential but I know that’s not the truth. Jay found what he needed at Templeton. Jay found wonderful, inspiring teachers who challenged him on a daily basis. He was placed in a space where creativity and vulnerability had to coexist. At Streetfront, he was shy, reserved, head a little bowed. Once he got into the theatre, everything changed. He became a man. He acted in 4 major plays and countless smaller, ensemble bits. He did stagecraft and direction. They traveled the country, performing and receiving adulation wherever they went. The kid who sat back, a little slumped in his chair at Streetfront was now clamouring for the spotlight. A metamorphosis had taken place. He was off. Jay had such a successful grade 12 year that he was the recipient of a Templeton Foundation scholarship (this relationship will be fostered and tended to for years) – he would have any post-secondary program paid for in full. Now the Templeton folks hoped he would continue theatre but Jay had other plans. 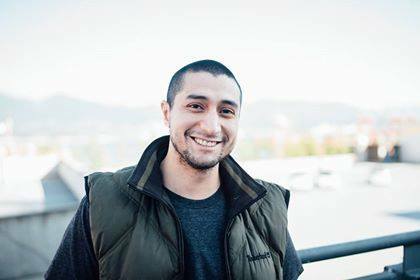 He always loved cars (again his East Van colours shining through) and wanted to be an auto mechanic, so he enrolled in Vancouver Community College’s (VCC) Auto Mechanic Service Technician Program. The kid I knew at Streetfront was now long gone. He was hyper-focused. He dedicated his life to auto mechanics. He was their top student with a 92% average and won a scholarship. Jay wasn’t content with this. He always liked auto painting and refinishing and now wanted to enroll in VCC’s 1-year program. He went back to the Templeton Foundation and asked if they would sponsor his second post-secondary program. They agreed without hesitation. Jay excelled in this program as well, graduating with a 91% average. He quickly got a job and started doing what he thought he always wanted. But in such Jay fashion, that mind of his started to look at this career path a little more critically. Jay started to recognize how damaging the chemicals, fumes and other products were for his health. Within a year, Jay had the foresight to recognize that no job, how much he liked it, was worth his health. Now while all this car stuff was going on, Jay had always had a part-time job working at a restaurant on Commercial Drive. He had been working in the kitchen there since grade 11, heading out to his shifts after his VCC schooling or after his auto-painting job. He started to really appreciate the creativity and skill needed to excel in the kitchen. He left the mom and pop restaurant for a larger and more sophisticated kitchen. While there, the ever-curious Jay, received Anthony Bourdain’s Kitchen Confidential. This book regaled in the carnal, salacious and insanely stressful world of fine dining. Jay loved it. He made a pledge to seek out the best chefs in the city and use their kitchen’s to develop his skills. Soon he was working at the Fish House in Stanley Park under the tutelage of renowned Chef, Karen Barnaby. Next, he moved on to Chambar and worked under Chef, Niko Schuerman. Jay suffered mightily with the stress and anxiety of working in a demanding kitchen but loved the rush and the expertise needed to create memorable dishes. Jay then moved on to Ensemble, owned and operated by one of Canada’s premier Chefs, Dale MacKay. Again, he threw himself into the maelstrom of a throbbing kitchen. Now just like with the cars, Jay came to a precipice in terms of careers. Part of him loved the insanity of the kitchen but part of him knew the toll it was it taking on his health. To add to this, at the height of his cooking journey, he never made more than $14 an hour. Like Jay had always done, he took the time to understand where he was and where he wanted to be. He’s always been prudent in those matters. As he tells it, he was at New Brighton Park, trying to divine some sort of inspiration into what was next, when a video game from his childhood popped into his head. Video games had always been a big part of his life and as he ruminated about his future, he wondered about designing video games. Could I do that? As Jay is wont to do, he went home and started researching. He literally spent day and night figuring out what skills he needed. He started religiously watching YouTube tutorials on 3d animation. He studied and built 3d models using an open source program called Blender. He started connecting with other like-minded artists, working collaboratively to increase his skills. While he was doing this, he was working as a plumber’s apprentice during the day, working in kitchen’s at night and then hammering back the espresso’s to keep honing his animation skills into the next morning. He sold his precious collection of mountain bikes (all 4 of them) and after 2 years had saved enough to pay for half of the tuition for the 3d animation program at the venerable Vancouver Film School. The other half of the tuition came from a familiar source. The Templeton Foundation, which had paid for his auto mechanic and then paint and auto finishing programs 10 years earlier, agreed to sponsor Jay’s latest vocational pursuit. Jay built up his 3d portfolio and submitted it for their inspection. They were very impressed and accepted Jay into the program. The next year proved to be the most challenging, rewarding and transformational in Jay’s life. He lived at the VFS Gastown studio. He was putting in 90 to 100 hour weeks. He immersed himself in the program like no other student. The 3d animation program basically comes down to the term project – the demo reel. This is the make or break part of the course. You will be judged almost entirely on this one 30 to 60 second piece of animated art. Jay put everything he had into it. He drew from his first love of cars, from the esthetics of fine dining, from the showmanship of theatre. His demo reel would be Jay Corpeno. It would represent what he believed in. To say it’s beautiful is not enough. It is staggering. When I first watched it, I’m not sure if I’ve ever been more proud of a former student. It was sublime. Jay graduated as one of the top students in the class. His demo reel was used on the invitation to their graduation. His demo reel was on the VFS homepage as an example to prospective students of what they could accomplish. He now speaks on panels as a distinguished alum and recently came back to Streetfront to show the 2017 crop of Jay Corpeno’s what he had accomplished. The kids couldn’t talk as he went through his presentation. Their eyes were stuck on the screen; searching for something they couldn’t find -imperfections or incongruences in the images. The images were so real they seemed imagined. When the lights came on and eventually Jay left, a student came up to me and asked if he could see Jay’s demo reel again. I played it for him and he walked right up to the screen with his eyes, mere inches from the screen. He shook his head and walked away. Recently, I’ve caught him at the computer looking at the demo reel weeks after Jay’s presentation. He told me it makes him happy to see a Streetfront kid make something so beautiful. He’s really glad Jay made it. So am I.
I’d like to introduce you to Julio Corpeno, an East Van original. Please check out his demo reel. You need to turn up the volume. This is art. This is love. Remember, all of this is animated. All of it. THANK YOU SO MUCH from the bottom of my heart for describing my brother’s journey from Streetfront up to now. You have truly captured Jay’s character, passion and drive. My family and myself can’t express enough thanks to you, the rest of the Streetfront staff, and all the other people that supported Jay growing up – the people that helped him become the man that he is now. I am so proud of him!